Q1. I have my own Recruiting firm. Can ClearPath engage my workers for me? A1. As part of our Employer of Record service, ClearPath has a program to support small independent recruiting firms and solo recruiters who have a proven track record. Once you find the candidate and negotiate rates, we’ll engage your employee, invoice your client, pay your employee, collect the client’s payment, and pay you your margin. We’ll agree to a mark-up, and your fee will be the difference between your bill rate to your client and our bill rate to you. Q2. I’m a Staffing Agency. Can ClearPath help with my back office? A2. Yes, ClearPath has supported small- to mid-sized Staffing Agencies for over 20 years. We are licensed in all 50 US states, allowing Staffing Agencies to expand their service area without all the extra work of establishing accounts with taxing agencies or enforcing wage and labor laws in those states. By outsourcing candidate payrolling to ClearPath, Staffing Agencies increase productivity, reduce their costs, and get competitive while improving the level of service delivered to clients and candidates. Q3. My business is outside the US. Can ClearPath pay my employees working in the US? A3. ClearPath has successfully supported a number of businesses that wanted to expand to the US but it didn’t make fiscal sense to do it on their own. Rather than setting up a legal business entity and going through the administrative nightmare of researching all the taxing authorities and labor regulations to operate a compliant business, they contracted with ClearPath to become the employer of record and take care of all their employees. Q4. Does ClearPath serve all industries? Q1. Can every software worker be paid as a 1099? A1. Many small software and technology firms tell us they think ALL software workers can be paid as 1099s. This incorrect belief is not true about any worker classification – either for software engineers or administrative assistants, or financial and accounting specialists. The profession itself is not part of any IRS or agency questionnaire; rather, the focus is on the dependence and integral role played by the worker. Q2. Is it true that I can pay up to ten 1099 contractors before the IRS will audit my company for misclassification? A2. There is no arbitrary number of independent workers that will trigger an audit. It could take only a single misclassified employee to capture the attention of watchdogs; with actions like a 1099 worker applying for unemployment benefits, or questioning their status, which can catch the eye of regulators who are hungry for what is perceived as missed payroll taxes, under-paid employee benefits, and potentially lost income taxes. Beginning in 2010, the federal government stepped up efforts to identify misclassified workers, with an announcement that they would conduct 6000 random audits to identify misclassified workers – activities that were accelerated one year later with budget increases, and which continue today. Q3. Can my accountant advise me if my business is at risk? In our experience, accountants are not always trained on worker classification to be able to fully assess and categorize a worker. Their focus is, of course, on accounting and financial reporting. They may advise, for instance, that regular employees who work at home – a number that has grown by 5.6% recently – could be incorrectly categorized as Independent Contractors. If they are misclassified in the eyes of federal and state governments, you will still be held responsible for fines, penalties, and interest. In many cases these fees are retroactive. Q4. If a worker spends less than 40 hours a week on the job, can I pay them automatically as an Independent Contractor? A4. Classification checklists issued by the Internal Revenue Service and the Department of Labor do not allude to the number of hours worked as a checkpoint on worker classification. Problems with misclassification begin to pile up with this false belief, since both Federal and State mandates can accrue for W-2 workers, even with less than 40 hours a week. For example, states such as Connecticut, California and Massachusetts require sick pay accrual for days worked. If your workers are misclassified today, you could be held responsible for allocating retro benefits tomorrow. Q5. If someone is working from home, are they classified as an Independent Contractor? A5. Perhaps the biggest fallacy is the belief that all remote workers can be readily classified as Independent Contractors. In 2016, GlobalWorkplaceAnalytics.com reported that fully 50% of the US workforce holds a job with at least partial telework, and 1 of every 5 workers teleworks with some frequency. Fortune 1000 companies are actually revamping their physical plant and workspaces to accommodate these changes, which has no bearing at all on worker classification. 3.7 million W-2 workers now work from home at least half of the time. The kind of work, the methods for completion, and the relationship with the firm are the key factors in worker classification. Q6. Can all bookkeepers be paid as 1099 contractors as long as I file a 1099 to report payments? A6. Simply reporting contractor payments via a 1099 does not confirm a classification as being correct. 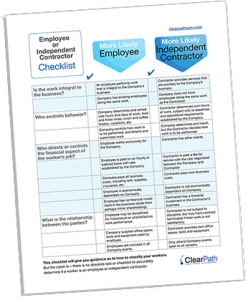 The employee’s work circumstance must still pass a detailed validation checklist for correct classification. While many bookkeepers work part-time or remotely, these factors do not automatically qualify a bookkeeper or any employee as a 1099. Only 6.6% of bookkeeping, auditing and accounting clerks are categorized as independent contractors, according to the Bureau of Labor Statistics. Q7. Is it true that if I am a small business I am not at risk for audits? A7. All companies are at risk of being audited. And the impact of an audit on a small business is much greater than a large company that has the resources to handle requests for additional information as the Internal Revenue Service or local agencies dig deeper to properly classify. Even an insignificant line of questions can demand outsized resources and time from a small business. Small Businesses have been “targeted” by the IRS as described in expert testimony given to the House Small Business Committee, convened in September of 2016, and reported in “Small Business Trends”. Q8. If I follow the IRS 20 questions, will I be fine? A8. The IRS 20-question checklist is a great start, but there are also individual state and external agency requirements that need to be considered. For instance, 19 states, including New York, Massachusetts, Michigan, New Jersey, and Iowa, have created inter-agency task forces to study the magnitude of misclassification and strengthen enforcement mechanisms. The National Labor Relations Board, which shares information with the other federal agencies, as recently as November of 2016 filed suit against a firm (Postmates, Inc.) for what they consider to be worker misclassification. You need a partner who has the resources to keep track of hidden multi-state and agency restrictions. ”Not knowing” isn’t considered a valid defense. Q9. If I settle with the IRS and admit blame, will my business be cleared from further repercussions? A9. No! This could just be the beginning of ramifications that need to be addressed. The company may still be responsible for back wages, mandated health insurance benefits, backlogged unemployment benefits or worker’s compensation. In addition, other agencies could be standing by to administer further penalties and fines, including the Equal Employment Opportunity Commission – focused on ensuring worker civil rights are upheld – or the Department of Labor (DOL), concerned with adherence to overtime and wage structures. To further underline this interest, in 2012 and 2013 the DOL collected more than $18.2 million in back wages on behalf of 19,000 employees who had been misclassified. Q10. Are highly paid professionals always classified as 1099? A10. This myth stems from the highly compensated consultants of years past, typically paid as corporate partners or vendors. That said, it is simply not true, and – just like with any type of work performed – the amount of payment does not influence classification. There is a great deal of income diversity with 1099 workers. Contingent workers are the fastest growing segment of the labor market today, tracking at 85% growth between 2005 and 2013, and accounting for 40% of all workers in 2015. Have you put your company at risk by misclassifying a worker?